Fine art, Illustration, graphic design and the art philanthropy of Sam Morrison: A Boat in My Living Room? Michigan winters can be rough! So rough in fact that I contacted a bad case of CABIN FEVER. 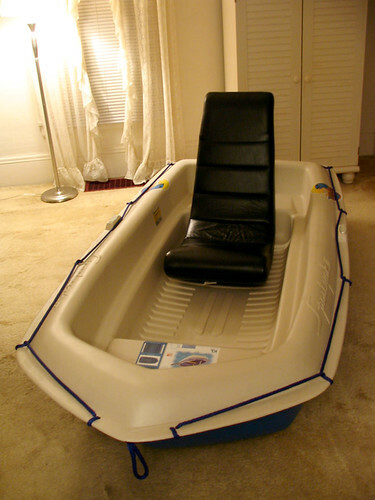 It was so bad that I went out and bought a small boat today. That boat currently sits in my living room. Unfortunately, I discovered the boat's seats were horribly uncomfortable. So I placed one of those upholstered video game chairs in the middle.... it's so unbelievably comfortable now that I've been sitting in it while I watch tv. Yep, just me sitting in my boat, watching tv, waiting for spring to come.... Sometimes I feel like Richard Dreyfuss in that scene from Close Encounters where he's sculpting mashed potatoes to resemble Devil's Tower. On a saner note: I've been kayaking for a number of years now and it's just not as comfortable as it used to be. So I needed a change. I've had my eye on this small boat for quite awhile. It's only 7' long, less than 4' wide and weighs only 55 lbs. With the addition of the video game chair it's ultra comfortable.